The Whole Megillah (TWM): Why Spinoza? How did you come to this subject? Devra Lehmann (DL): Spinoza had hovered in my mind ever since high school, when my Jewish history teacher briefly mentioned Spinoza as a Jew tragically gone off the path. We quickly moved on to the next topic, and our textbook, which had been written for Orthodox Jewish schools like mine, provided no additional information. It seemed fairly clear that Spinoza and his ideas were off limits. I can think of no better way to get a kid interested in a subject! For one reason or another I didn’t follow up until many years later, when a friend recommended that I read Jonathan Israel’s Radical Enlightenment, a book whose central thesis is Spinoza’s importance in shaping the modern secular world. I quickly realized that I needed to understand more about Spinoza, so I began reading Spinoza’s writings along with a lot of secondary literature. I was hooked. Bertrand Russell famously called Spinoza “the noblest and most lovable of the great philosophers.” Those superlatives are right on the mark. Spinoza devoted his life to an uncompromising search for truth, which meant that he questioned a lot of traditional ideas and made himself lots of enemies. But he stood firm, and he left us a priceless legacy. He was one of the first and most influential proponents of freedom of religion, freedom of thought, and freedom of expression. And he was such a kind and modest man that even his detractors found themselves praising his personality despite their outspoken horror at his ideas. TWM: How did you bring the manuscript to the attention of namelos? DL: I found namelos listed in the Market Survey of the Society of Children’s Book Writers and Illustrators. Let’s face it: a book about a philosopher will never be a major seller in the young adult market. So I knew that only a small, idealistic publisher would be interested in my project, and I began to research my options. I was immediately taken by what I saw on the namelos website—although the first thing that caught my attention had nothing directly to do with books. It was shortly after Sandy Hook, and the site featured an achingly beautiful drawing of an angel collapsed in sorrow over a school building, alongside the name and age of each precious individual killed in that terrible tragedy. That picture brought me to tears, and I knew already that I’d want to work with the people behind it. But the namelos list featured nothing even close to my project. Their books looked fascinating and important, but the focus was definitely fiction; the closest thing to my manuscript seemed to be a collection of poems about the life of George Washington Carver. Just on the off-chance that namelos might be interested, I used the “contact us” link on their website to send in my first few pages. I was thrilled to hear from Karen Klockner, editor extraordinaire, a couple of weeks later. Apparently namelos had been harboring plans to expand into nonfiction, and my project caught their interest. TWM: Karen, what attracted namelos to Devra’s manuscript? Karen Klockner (KK): Devra sent us a very organized and professional proposal. She conveyed not only a clear sense of the book as a whole but why it should be published and who the market would be. We were intrigued by the topic, and there was something in her writing voice, even in her proposal letter, that spoke to us. Devra is a wonderful writer with a passionate, engaging intellectual curiosity. She is a true teacher with an inspirational desire to share and exchange ideas. TWM: Do you do much nonfiction? KK: I have always published a great deal of nonfiction, but this is our first nonfiction at namelos. TWM: How do you characterize the market for this book? TWM: Devra, what was your previous writing background? DL: Well, as a teacher I spend a lot of time thinking about good writing and commenting on my students’ papers, but I’m afraid I don’t have much of a pedigree in producing my own work for young adults. When I was in high school, I wrote a play about religious censorship that won an award from The New York Times. In graduate school I wrote a master’s thesis about the relationship between literary theory and rabbinic approaches to textual analysis. And eventually I completed a doctoral dissertation about the secular and religious discourses—essentially whole ways of thinking, being, and speaking—that I observed in an Orthodox Jewish high school. Based on my doctoral research, I wrote three articles that were published in academic journals. It may not be obvious, but this is all related to a young adult biography of Spinoza. A lot of what I’ve written has focused on the interplay between secular and religious worldviews, and that interplay figured prominently in Spinoza’s life. But what I consider more relevant is something that my daughter once said about my dissertation. She was reading over my shoulder as I was typing up one of my chapters, and suddenly she exclaimed, “Hey, Mommy, even I can understand this!” She was twelve years old at the time, and I took it as a great compliment that I could take complicated ideas and make them clear to a young person. TWM: What did you like to read growing up? DL: It’s probably ill-advised to confess that as a child I never read nonfiction for pleasure, but the truth is that back then I found fiction much more engaging. I’ll add, though, that as a teacher I’m amazed to see how many of my students are just the opposite—they’ll read loads of nonfiction on their own but will never pick up any fiction unless it’s been assigned. In terms of the specific works I liked as a young adult, I guess you could say either that I was born at the wrong time or that it was already obvious I’d turn into a stodgy old English teacher. I loved Jane Austen, Charles Dickens, James Joyce, Virginia Woolf, O.E. Rolvaag, and Hendrik Ibsen. Before my high school years, I loved C.S. Lewis and J.R.R. Tolkien. I really don’t know if there is much of a pattern here. TWM: What authors inspire you? DL: That depends a lot on the mood I’m in. In general, though, I love authors with the breadth of imagination to create entire, believable worlds—authors like William Faulkner, who interwove huge numbers of complex characters to create an entire history of the fictitious Yoknapatawpha County; A.S. Byatt, who in Possession presented such convincing diaries, poems, and letters by Randolph Henry Ash and Christabel LaMotte that I was absolutely sure they were real Victorian poets—and ashamed of myself for not having heard of them before; J.R.R. Tolkien, whose Middle Earth comes complete with its own intricate history, languages, and mythology; and Louis de Bernières, who masterfully balances hilarity and tenderness in his offbeat trilogy about a mythical South American country. In nonfiction, I’m a big fan of Edmund Morgan, who was also one of my professors in college. Morgan was one of the greatest scholars of early American history, but his style is so lucid and unpretentious—like the man himself was—that my children were able to enjoy some of his work even before they got to high school. Other favorites are ancient writers who show me the amazing continuity of the human experience, despite vast differences in culture. It is a thrill to read Thucydides, whose keen observations about human nature are just as timely now as they were almost 2500 years ago, and even Beowulf, whose misty fens and monsters seem so alien today, contains one of the most piercing descriptions I have ever read of a parent’s grief over the death of a child. And finally, I love authors who help me understand the lifelong endeavor to be true to oneself. E.M. Forster ranks high in that category. TWM: Congratulations on the National Jewish Book Award win. What does the win mean to you? DL: Thank you. I see the award mostly as a heartening vote of confidence. I encountered a lot of skepticism about my project, both from friends and from professional contacts, and as a teacher I found that skepticism infuriating. In any thoughtful classroom, kids encounter and debate important questions all the time—and they genuinely love to do so. The biggest problem is figuring out how to end the heated give and take so that kids can get to their next class on time. So to me a young adult book about an important philosopher seemed perfectly natural. I found a wonderful partner in namelos, and I’m delighted for them and for myself that we’ve received this kind of validation from the Jewish Book Council. The publicity helps, too! KK: We were very gratified by the award from the Jewish Book Council. 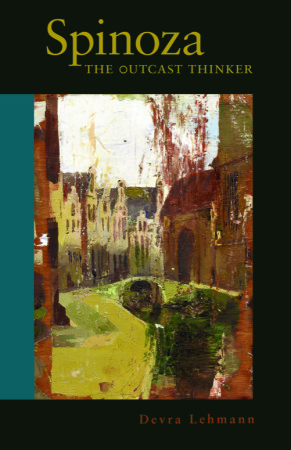 The book focuses on the life of one man who was born into the Jewish community of seventeenth-century Amsterdam and who tried to live a thoughtful, honest life—asking probing questions about the nature of existence. The dramatic historical setting in which he lived and worked is part of the portrait Devra paints. TWM: Are there more books in your future? DL: I certainly hope so. I’m now in the middle of a young adult biography of Socrates, and I’m hoping to tackle Saint Augustine next. I’d also like to backtrack one day to write a play about Spinoza’s life after his excommunication. I’d originally undertaken Spinoza: The Outcast Thinker as a warm-up exercise to help me prepare myself for that play—I’d naively thought the biography would take only a couple of months!—but, as you see, my project of bringing great thinkers to young people has taken on a life of its own. TWM: Are there other nonfiction books coming from namelos? KK: We make acquisition decisions on a book-by-book basis. We are considering other nonfiction projects, and especially look forward to seeing Devra’s proposal for her work-in-progress on Socrates. This entry was posted in Two-in-One and tagged devra lehmann, karen klockner, namelos, spinoza the outcast thinker. Bookmark the permalink. Nice interview! I shared it on Twitter. So nice to meet someone as articulate and intelligent as Devra. And doubly nice to hear namelos praised – a press of great integrity and courage.